Father's Day weekend started for me on Friday at my sons nursery school as they held a Daddy and child model making session. As Mummy was attending BritMums Live I put L-A in her pushchair and we both headed off to TP's nursery school to see what fun activities awaited us. Once we arrived at his nursery and finally found him TP took us over to an empty space in his playground and disappeared, then all of a sudden he reappeared with boxes, glue, scissors and sticky tape saying "Daddy, Daddy I wanna build a T-Rex, I wanna make a T-Rex Daddy" at this point I thought " God help me, how am I going to do that?". 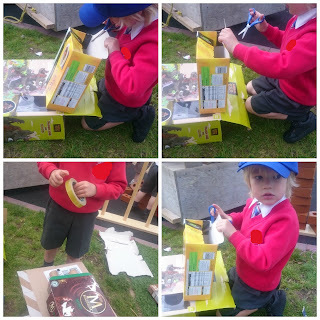 So I grabbed the boxes and thought very hard about how to make a T-Rex or even something that might even resemble a T-Rex or even something that would look like a dinosaur to be honest whilst I was looking round and seeing other Daddies constructing wonderful looking model dinosaurs. I began sticking boxes together and attaching toilet roll tubes to the boxes whilst TP disappeared off with his friends, playing and looking at what their Daddy's were making. 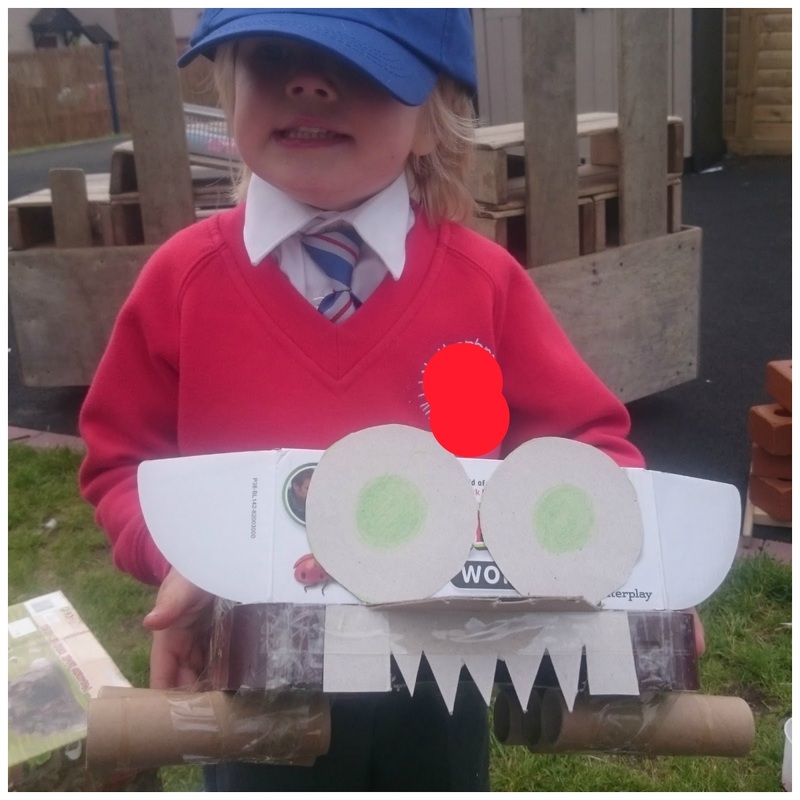 "A T-Rex is what he wanted" I could hear myself thinking, "it looks more like a bloody robotic spider" I could hear myself saying aloud. TP finally reappeared with an apple in one hand and a carton of milk in his other, he looked at his model, looked at me smiled and said "Daddy that's awesome thanks" music to my ears. 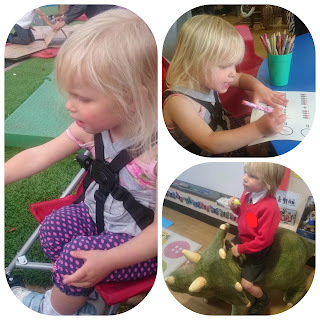 As well as model making the children had dinosaur related stories read to them, they played games based around dinosaur themes and everyone had a fabulous time right up till it was time to go. Now was the time I have to openly admit that I enjoyed and enjoyed I did just that lol. I've not gone mad but picture the scene if you can, all morning the Daddy's had been making fabulous models for their little treasurers, obviously although they won't admit it they were competing against each other as Daddy's do to make the best and the biggest models going. Mine was about the size of a standard computer keyboard and easy to carry this is were it go fun. The teacher pipped up with "the session is now over, thanks for coming, hope you all had fun and please can you all take your models home with you", boom that was like most of the Dads had been smacked in the face by the teacher herself as you could see the Dads thinking "great I made this bloody model big how am I supposed to get it home?" Whilst I just walked past them all with TP happily carrying his model easily home for everyone to see what we'd made at our model making session lol. Since June 2013 Tammy has been attending BritMums Live without fail. In 2013 she was that nervous about going and meeting up with fellow bloggers she took our little princess L-A with her for company. I took the boys down to meet up with her after nursery had finished so she wasn't alone and scared, so she had some company and so she had her loving family around her in the big scary city. Obviously whilst mummy attended BritMums Live I did take the boys sight seeing round London which was awesome, we did so much and saw so much in those two days, you can read about our fun and interesting experience's here. Last year she went to BritMums alone, well I say alone she actually roomed with the ever awesome Cathie Boyle, which was great for her because she had company for the entire weekend and wasn't going to be alone and scared staying in the hotel by herself. It also gave me piece of mind that she wasn't going to be alone, that she'd have a fab friend she was rooming with and she was going to be safe. Well that leads us to BritMums Live 2015, the one I had been dreading for weeks in all honesty, why? I hear you ask, because this BritMums changed everything, Tammy wouldn't be alone anymore instead she'd she had the company of her new boyfriend. Yes I imagined she'd still be scared and nervous but that's how she is but she'd have him to put his loving arms around her, to look after her, to comfort her to protect her in her time of need. This was the BritMums that Tammy wasn't coming home as my wife but instead returning as my ex wife and more so just the mother of our children. I would like to go on record and put the world to right about the situation myself and Tammy find ourselves in now. As many of you would of found out this weekend either via Twitter on Sunday or at Britmums on Friday and Saturday, Tammy and I are no longer together as husband and wife and Tammy is now in a new relationship with another man who some of you may or may not know. Some of you may find the whole situation shocking and through what's been said to myself some of you found it a little awkward at Britmums seeing them two together whilst I was alone at home looking after our three wonderful children. I would like to at this point thank each and everyone of you who took time out of your busy days to check in on me and see how I was doing and offer me your support and kinds words, so for that I'm extremely greatful. It's Not All How It First Appears, yes Tammy is now with her new boyfriend and I truly wish them all the happiness that their time together will bring them for many years to come. "Daddy why do you and mummy argue? Why can't you two be happy together?" "mummy you and daddy are never happy like those (point to the bride and groom) were you ever happy mummy?" Then you realise it is as bad as you thought and you hadn't done a very good job of covering it up for the children. As for Tammy's new boyfriend his been a solid rock to her helping her deal with TP's autism, something that I couldn't do as I didn't understand it myself in all honesty let alone how to deal with it all. So yes over the month's they have grown closure together as we have moved further apart to the point we became more like friends living under the same roof rather than husband and wife. I noticed the signs that he was making her happy before she did in all honesty, the little smile on her face when he messaged her, the twinkle in her eye whenever she mentioned him and strangly deep down in my heart I knew before either of them that they'd end up being together as a couple. Then came the night we went to bed at 11 and chatted all night long till I got up at 5.30, we chatted about our past, our present and our future, I told her that although it was extremely hard to accept I knew this was the right thing to do for all concerned to call a day on our marriage. I told her I wished her and him all the best for the future, to not make the silly mistakes we'd made over the years, to tell each other how much u love each other on a daily basis and to be happy for many years to come. Then it was like a massive weight had been lifted, we both felt alot happier than we had for quite a while in all honesty. "You Can't Help Who You Fall In Love With"
Today whilst JR was at school Tammy and I decided to take TP and L-A swimming. Well when I say we took them swimming what I mean is I took them all to the leisure centre and took some photos whilst mummy took them in the pool as I don't like going swimming. Today was a special occasion for the children as it was the first time they'd got to try out their new Swimfin, which they loved having with them. The pool was a bit busy as there was a school swimming lesson going on at the same time which slightly scared my two at first but they eventually began to enjoy themselves and even more so when mummy let them have the Swimfin on, then it was time to go and fetch JR before we even knew it lol. I like many other Daddies out there love reading stories to their children, whether it be old story books you have read time after time or new stories that none of you have read before. So when I was approached to see if I would be interested in reviewing a Peppa Pig book from Ladybird for the children I naturally jumped at the chance. My children love watching Peppa Pig and have a few Peppa Pig books already of their own so when Daddy told them I had a new book to read they couldn't wait to go to bed and have it read to them as much as I couldn't wait to read it to them. 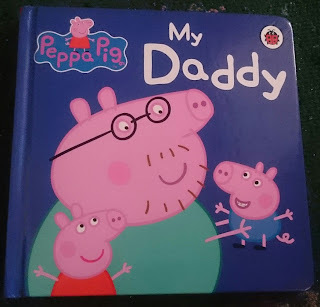 This Peppa Pig book is about Peppa and George's Daddy and all the things they love about him and all the things he does with them they love doing. When you read this book with your children you can read the pages and relate to the story and if your like me you can even adapt the things on the page to what you do with your little ones to add a extra bit of extra fun the bed time reading. This book is price marked at £4.99 which I think is a reasonable price for a hardback book which can be used over and over again across the bedtime years. I did however find this book on a few Internet sights priced at £2.99 which makes it a even better bargain for such a fun bedtime book. Now is your chance to win your very own copy of this fabulous book my entering my competition below. This book was sent to me free of charge and all the opinions and wording is solely mine.